Walking near the edge of the farmer’s field you can see many weeds where the open field meets the trees. 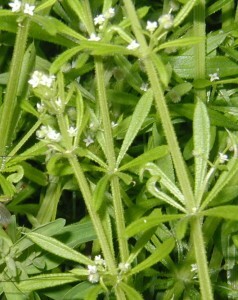 On 15 May 2010 I saw this familiar weed, Cleavers, that grows in fields, waste places and along the side of the road. A few days earlier there was an untouched stand of this weed and the large grouping looked pretty cool. Always have your camera with you! When I came back to photograph the weeds, I saw that someone had been there before me. Matted circles show where deer most likely bedded down the night before. 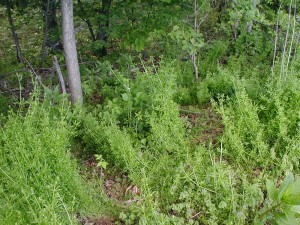 These weeds get about three feet tall and are prone to laying over to the side when they get that tall. The circular patches with the weed tramped down tell the story. The tallness of the weeds would serve to hide the deer even as they lay there. Cleavers, Galium aparine, is a member of the Bedstraw Family, Rubiaceae. 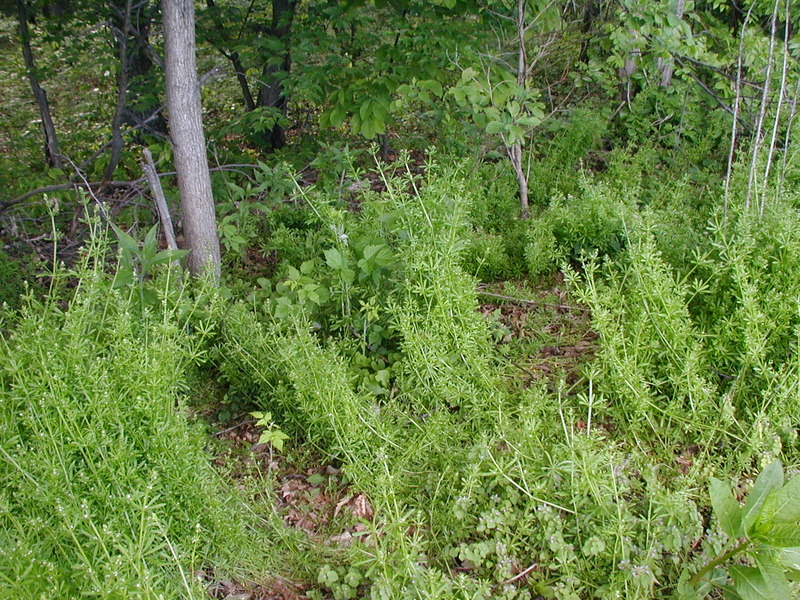 I guess it makes sense that an animal would use a plant referred to as bedstraw to make their bed. People figure some things out for themselves and other things we learn by watching. If people witnessed these large mammals lying down among the cleavers or bedstraw, people probably tried it for themselves. Early botanists may have named this family of plants because of their usefulness as bed stuffing. Small white flowers cluster on stalks that project from the leaf axils. Small white flowers project from the whorled leaf axils. The other day I went back up to the field to see if I could get some better pictures of the cleavers flowers, but the farmer had sprayed some herbicide to ready the field for planting. The cleavers had already died back, which reinforces the idea that you should take more pictures than you think you need to assure that you get at least one good shot. 2010 was the first year that we witnessed flowers on this member of the Orchid Family, Orchidaceae. 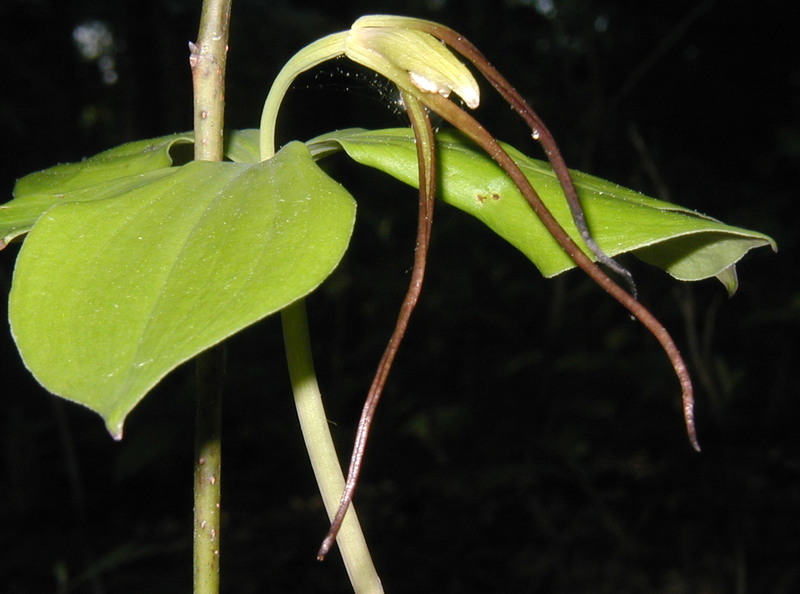 From a florist’s point of view the strap-like blossom of Whorled Pogonia, Isotria verticillata, is nothing to write home about. Heck, it’s barely noticeable that it’s a flower, unless you know what to look for. Whorled pogonia rises up from the ground with a single, hollow stem. The stems are light-colored grey and smooth. At the top of the 6 – 12 inch stem is a whorl of five leaves, and sometimes six. 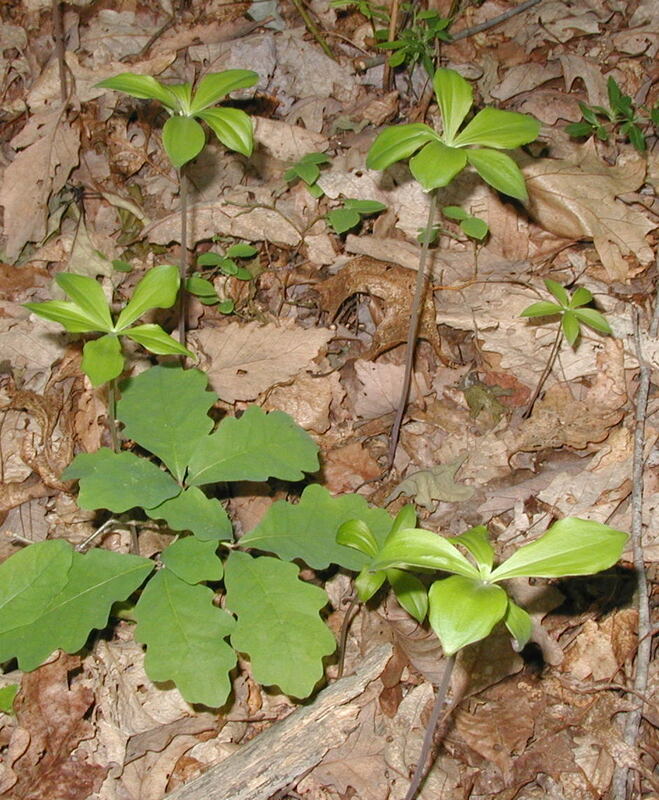 Six Whorled Pogonia plants of different heights. I’m assuming that the smaller plants in the photo above are later or smaller versions of the taller plants, instead of the rare Small Whorled Pogonia, Isotria medeoloides. 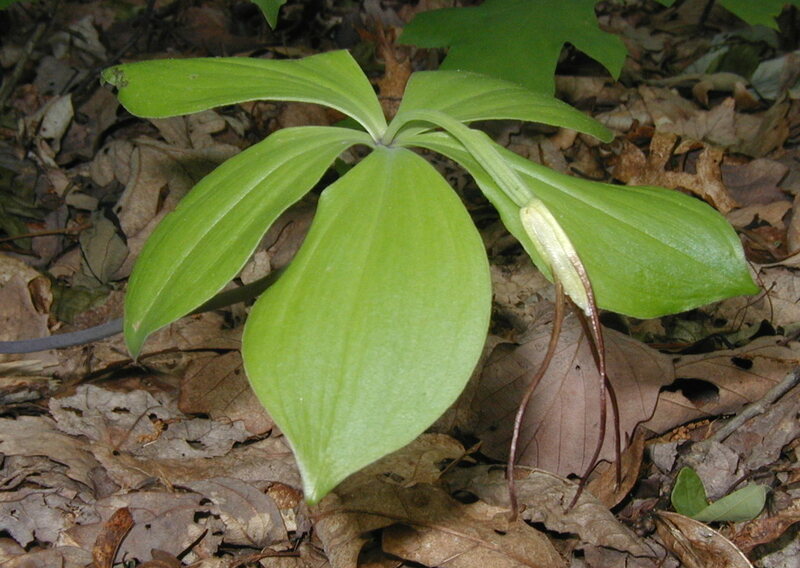 Until I saw some of the Whorled Pogonia blooming this year I was uncertain which pogonia we had. The two Isotria species appear the same except for stature and the length of the sepals. The sixth leaf on a few plants seems to be an afterthought. 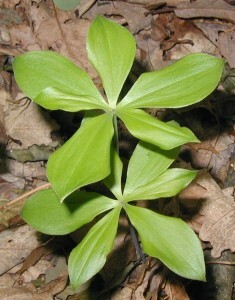 Leaves are pointed ovals that are widest near the tips. 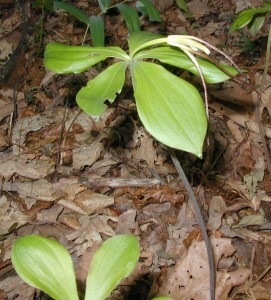 Flowering Whorled Pogonia with parallel-veined leaves. 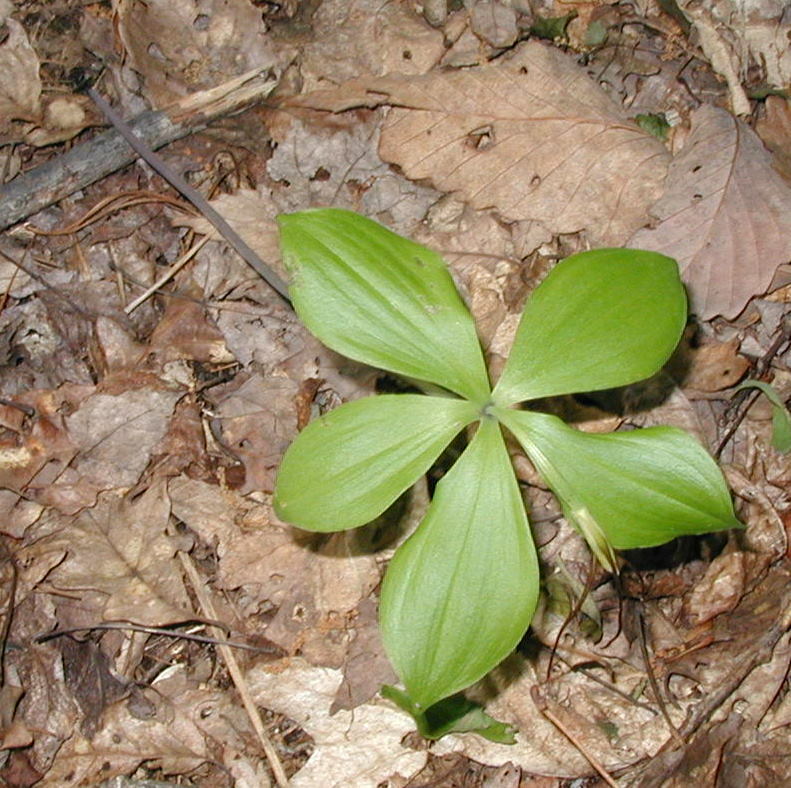 Linear or parallel veins in the leaves help to identify the pogonia as a member of the Monocotyledon which include the grasses, grains, lilies and orchids. 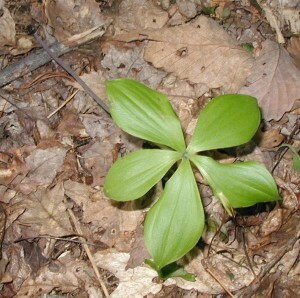 From the center of the whorl of leaves arises a singular flower. A flower stalk holds the blossom about an inch above the circle of leaves. The blossom arches over to one side. Three muted yellow petals enclose the stamens and inner flower parts. The blossom itself appears somewhat closed as it is enveloped by the very long, strap-like sepals. 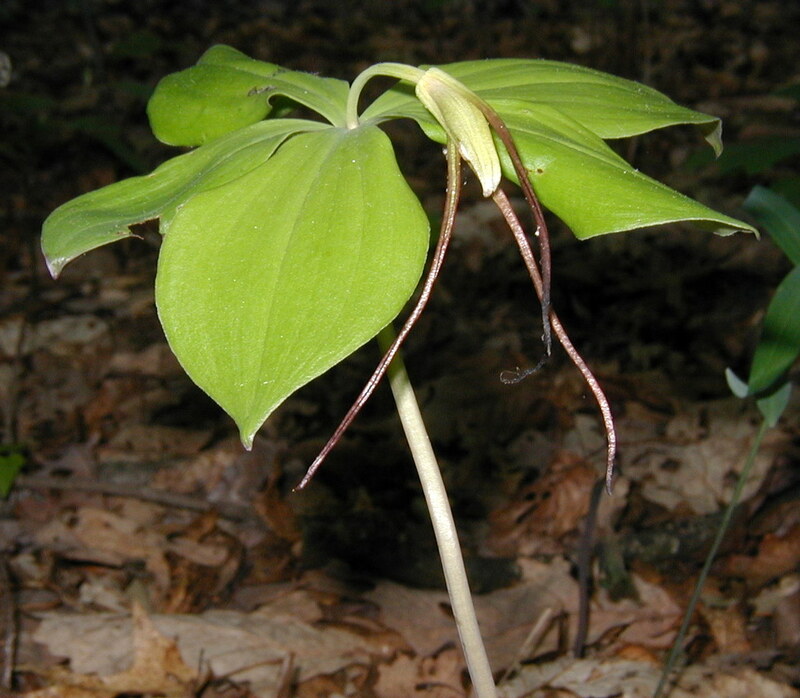 The sepals are brown to dark maroon with a shiny surface and they stretch out about three inches long. The sepals of Small Whorled Pogonia may be about an inch long in comparison. 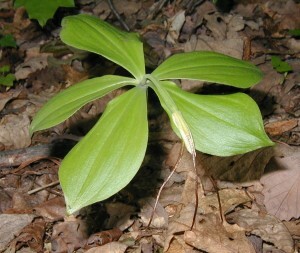 Photograph of Whorled Pogonia on 17 May 2010. 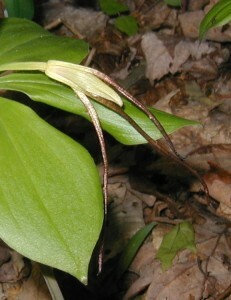 The extra long sepals are diagnostic for distinguishing Whorled Pogonia from Small Whorled Pogonia. Extra long sepals of the flowering pogonia orchid. Photo taken 15 May 2010. Edge-on view of a whorled pogonia flower. Photo taken 15 May 2010. Flowering Whorled Pogonia on 17 May 2010. Another specimen of flowering whorled pogonia. Looking down on the flowering orchid. Looking down on the orchid…can you see its flower? 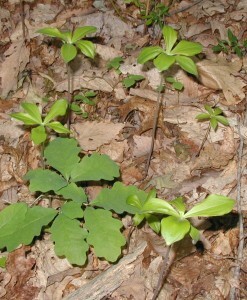 The stem enters the ground in the upper left of the photo above. Very few of the whorled pogonia were blooming. Even though there were only 3 of 68 plants blooming in one area, and slightly north a different patch had a single plant blooming in a group of eleven, I was very excited to see them flowering. I’ve watched these orchids for years now, wondering which pogonia I was looking at. Now I know that we have Whorled Pogonia in our forest.